Poland was a licensed manufacturer of the Russian T-55 and of course had made modifications of these for their own use. Several thousand were build by Poland, which means of course it would need a number of combat support vehicles, such as Combat Engineer, Armoured Recovery Vehicle and Armoured Vehicle Launched Bridge. 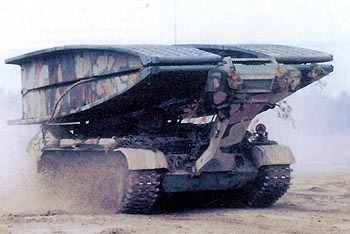 The Polish BLG-67 AVLB was for the Polish T-55 fleet. The vehicle was a joint development between Poland and East Germany and manufactured in Poland for service in both countries. The bridge is a scissor type, which was more the common at the time of the vehicles development. It can cope with the a maximum load of 50tons per crossing.